Finally, I’ve got round to self publishing my first novel. Since getting the rights back from my publisher, I’ve re-vamped (see what I did there) the cover and launched it on Amazon. The moon was no more than a sharp-white crescent—a vivid contrast to the starless blanket of black it rested upon. It was bright but not bright enough to illuminate the beach in the early hours of a Sunday morning. The girl lay motionless in the man’s arms as he carried her across the sand to the rhythmic lapping of the tide. Her vision glazed as his image burned its way into her retinas with all the permanency of a photograph. She closed her eyes and her chest heaved as her failing lungs fought for their final breath. With her short life ebbing away, she fell from his arms into the clear, shallow waters beneath. The cool tide began licking her skin and filling her nose and mouth with noxious liquid. Paralysed and incoherent, she lay there while the unforgiving waves spat and fizzed against the rocks nearby. Her deep auburn hair lay fanned out in a halo sprinkled through with grains of shimmering crystal. Each new wave formed a fresh well of water that pooled around her features, drowning her hazel eyes and stealing her soul from within them. One arm lay across her body whilst the other lay gracefully by her side. The rushing water played her fingers like the ivory keys of a piano. As her blood continued to seep from the fatal wound, it was cleansed by an ocean trying desperately to restore the girl’s mortal beauty. Her backpack lay beside her—a poignant marker of the final days of the girl’s life and the only clue as to her identity. It quickly filled with water, turning the bright-red fabric burgundy, and ruining the contents forever. It’d been a moment of weakness. He thought his bloodlust was under control until that girl had crossed his path and his instincts took over. He’d suppressed those morbid urges for such a long time—it was hard, to the point of painful. He just couldn’t help himself. The relief at causing her death was immeasurable—like a high-pressure valve had been released deep inside of him. The remorseless butcher walked away from the girl’s body without looking back. His footprints in the sand disappeared as fast as they formed as he strode along Aghia Pelagia’s quiet shoreline, leaving his latest victim to the mercy of the ocean. As her body became weightless, it was carried beyond the sand, beyond the fizzing white foam and into the livid black waters of the Mediterranean. For a while, it would remain lost beneath the tide—swallowed by the insatiable appetite of the ocean. Nicole Silverson woke to the sound of her mobile as it vibrated its way off the side table and wedged itself under the bed. Refusing to open her eyes, she clambered to reach it, inadvertently switching it on. Forcing her eyes open, she glanced around the room. The early afternoon sun was streaming in through the small window and specks of dust spiralled playfully in the hazy beams. “I think you’re forgetting who was carrying who,” countered Nicole. Nicole didn’t need reminding of the guilt she was still suffering for ending a four-year relationship. Rob was someone, who, she sincerely believed, deserved better. “I guess not. I did the right thing, Jules. Rob just needs a bit more time to come to terms with it. It’ll be better in the long run. Well, anyway, when are you coming out to see me?” She sat up pushing a mass of dark blonde tangles away from her eyes, trying unsuccessfully to stifle a yawn. “What’s the temperature like in Crete, in August?” asked Julia. “You really want to know?” Nicole couldn’t resist mocking Julia’s earlier words. The line went dead before Nicole had a chance to respond. Julia had been Nicole’s best friend since pre-school and to say she missed her was an understatement. Nicole pictured Julia; so familiar, so pretty with shoulder-length, dark hair and skin that turned golden with a mere glimpse of sunshine. Her eyes stung as she tried to stop them from filling up. When you’re away from home and from everyone you love—you have to stay strong and Nicole was trying her hardest to stay strong. Dressed simply in a denim skirt and white T-shirt, Nicole left her Stalis apartment and arrived at The Azure Pool Bar just after midnight. It was fairly quiet, with just a smattering of stray drinkers who’d staggered in off Malia’s chaotic Beach Road. Malia was a haven for partygoers and, for some time, had been known as the ‘Club Capital’ of Crete. The barman glanced up with a smile as Nicole grabbed a stool. “What can I get you, honey?” His accent remained true to his west-Canadian roots. “A couple? Buying me drinks already, Nicole, that’s pretty forward. Not that I’m complaining.” His grin spread shamelessly. “Don’t worry, I will. That’s what I love about that girl—she’s got such good taste. Anyway, you ladies have a good time.” He turned to serve an older couple settling themselves at the bar. Chris managed The Azure Pool Bar. He was an easygoing, mild mannered character who Nicole already considered a friend. His unruly blond hair complemented his steel-grey eyes and he emitted calmness and magnetism that drew people towards him. It was a charming trait apparent in a few of Nicole’s new friends. She hoped they found her equally as easy to be around, but somehow doubted it. Glancing out to the darkness of the outdoor pool, its restful surface glinted and sparkled with reflections from nearby street-lamps. Hypnotised by the dancing facets, Nicole considered her reasons for returning to Crete. Since her visit the previous summer, the island had a draw on her that she couldn’t quite explain. But it was the loose tales of witchcraft and sorcery that’d given her the reason she needed to return to the largest of the Greek islands. She intended to find out all she could and put a book together upon her return to England. It would be her second paranormal publication, and with the help of her new contacts, she was keen to make a start on it. Nicole was lost in her musings by the time Anna arrived. The young, bohemian waitress snuck up beside her. “Hey, daydreamer,” she whispered, then put down her bag and pulled up a stool. “Are we talking about your research into the paranormal or into the barman?” Considering she’d just put in a five-hour shift at the restaurant, Anna was vivacious and sparkled with energy. “Well, what can I say? He’s hot!” The words fell from Nicole’s lips before her brain had a chance to engage. She glanced over hoping Chris hadn’t heard, but her gaze was met, causing the heat in her cheeks to intensify. Chris smirked and turned away. “Yeah, it’s in here somewhere.” Nicole rooted around her bag and pulled out a black hardback. As she handed it to Anna, her fingers brushed across the glossy printed cover and over the swirly-silver lettering that read—OUR HAUNTED ISLE by N. E. Silverson. Nicole often glanced over her previous work as a reminder that she was capable of such an accomplishment. Although it hadn’t made the ‘Best Seller’ list, it was generating enough of an income to allow her to survive modestly. Anna put the book in her bag and glanced at her watch. She took a long swig of lager and placed the empty bottle back on the bar. “Of course.” Anna pulled her compact out of her bag, touched up her already perfect makeup and tucked stray strands of sun-bleached hair neatly behind her ears. As they packed up their belongings, Nicole’s eyes were once again drawn to Chris. She shot him her sweetest smile and was a little smug when he returned it. By the time they left Azure, it was past two. The street was still bustling, the air was smouldering, and the music from the bars—deafening. There was less than an hour before Malia’s renowned three a.m. curfew, and the drunken tourists were spilling out onto the Beach Road. ‘The Garage’ was a grossly illuminated bar with an open frontage enabling its inebriated occupants to ooze out onto the street. The bar was packed and harshly lit with an array of different coloured fluorescents. It was crowded and Nicole wasn’t thrilled by Anna’s choice, but the girl seemed to be on some kind of mission and Nicole didn’t want to disappoint. “Sure, if you like,” Nicole replied with relief. Setting their half-empty bottles on the bar, they pushed and squeezed their way through the crowds into the cooler night air. “Sure.” Nicole tried to sound enthusiastic but her response was half-hearted. She was shattered and would have been more than happy to call it a night, but didn’t want to disappoint her friend. They headed further down the Beach Road for one last drink, which Anna promised would be non-alcoholic. Making their way down the street, their footsteps became more audible as they left the booming clubs behind them. “I’ll take you to Oasis. It’s quiet, you’ll love it.” Anna’s smile didn’t falter and Nicole wondered if her friend’s energy would ever wane? As they continued down the street, two men walked towards them. They were brusque and laughing loudly. Nicole instinctively avoided eye contact, preferring to keep her gaze firmly fixed on the pavement. Without warning, the two men grabbed Anna by the wrists and pinned her up against a parked van. They laughed and goaded her. Anna was petite and in her mid twenties. Her hair, although naturally light brown, had more than enough sun bleached highlights to be considered blonde. She had cinnamon eyes and her nose was pierced with the tiniest silver-stud. “Get the hell away from her,” screamed Nicole, as she grabbed Anna, trying desperately to prise her from the clutches of her captors. But Nicole was quickly seized, her screams muted, and both girls dragged into an alleyway. Built like bouncers, the two men looked like they spent every waking hour in the gym. Their heads were closely shaven and they wore matching tight, white T-shirts. Their conduct told that they’d not got what they came out for that night and were running short on time. “I don’t think that’s what you really want, sweetheart. I know your sort. I know why you come to these towns—just begging for it.” His eyes were bloodshot and watery as he tried to focus on his prize. “No…I…” Anna struggled to free herself from his grasp, but this seemed to make him all the more desperate for her. He pulled a knife from his jeans, the silver blade glinting in the darkness. Pressing it onto her cheek, the metal ate into her soft skin and a shimmer of blood ran down her face. “Just a warning,” he growled. As Anna cried out, a hand was quickly clasped over her mouth. With a wide grin on his face, the second man watched the struggle whilst clutching Nicole tightly by the arms. “Jesus, no, please just let her go,” Nicole pleaded, before being thrown back towards the van where everything around her went black. Hidden in the gutter behind the tyres of the van, Nicole awoke completely disorientated. Clutching the back of her head she winced as her fingers brushed over a painful swelling. A deep-throated groan came from the alleyway. Nicole swung around and tried to call out but her voice wouldn’t oblige. With her head spinning, she clambered to her feet and fought for balance. Her instincts were telling her to run, to go and find help, but she knew there wasn’t time. Anna didn’t stand a chance against such merciless attackers, so she staggered forward and peered into the darkness of the alleyway. With her pulse thundering in her ears, she focused in and held her breath at the sight that greeted her. The larger of the two men was laid out on the ground. A large gash in his throat was visibly spewing thick, dark liquid over his chest in rapid bursts. A horrendous gurgling sound was coming from the wound as his failing lungs fought for breath. Completely stunned, Nicole watched as the gurgling subsided and the man drowned in his own blood. Gasping for air, she tore her gaze away and strained to locate Anna in the darkness. Just a few feet from where Nicole stood, the second man dropped to his knees. With a blade protruding from the back of his head, he fell forward, smashing his forehead onto the concrete floor. The dull thud echoed around the alleyway causing Nicole to bolt. Blindly, she stumbled out onto the street where she collapsed to the ground, eyes wide and struggling for breath. Within moments, Anna emerged from the darkness. Blood was smeared across Anna’s skin and matted into her hair. The wound on her face was deep and looked painful but didn’t seem to slow her down. Anna led the way down the road, practically pulling Nicole along behind her. “Where…?” Nicole’s words wouldn’t form. Anna appeared to be running on autopilot while Nicole tried, unsuccessfully, to keep it together. They passed a group of people who, fortunately, seemed too drunk to notice anything untoward. They taunted Anna and gestured lewdly. She was stunning, even in the state she was in. “No, it’s really not. Where are we going? We have to call the police.” She stopped, slammed her palms to her chest and dropped to her knees, hyperventilating. Nicole’s whole body was shaking, almost to the point of convulsing, as Anna continued to lead her down the Beach Road to the crossroads where they veered off to the right. As they ran, her vision blurred. Dense shrubbery lined either side of the dusty road, and the route grew darker until it was almost pitch black. Unable to comprehend what was happening, she prayed it was just a nightmare that she’d soon wake from. Trying to discern her surroundings, Nicole’s eyes were drawn to the unmistakable outline of a cemetery. The huge concrete tombs were only just visible in the darkness. She could also detect the sound of the ocean, its rhythm serving as a slight comfort, and aiding her orientation. They followed the track a little further and soon approached a set of intricately carved oak gates. They were tall and stood wide open, revealing the most tantalising courtyard bar. Above the gates hung a large wooden sign with the words—‘Zeus Xenias’ burned into it. ‘Xenias’ was not a place Nicole had heard of and at that moment, it didn’t occur to her to ask why. Anna led the way in and Nicole timidly followed. Strings of lights hung in formation, gently ameliorating the darkness. Calm music played softly in the background and the air held the light aroma of incense. The atmosphere seemed cool and subdued. With crumbling stone walls and a dirt floor, the open-air courtyard appeared to be the relic of some ancient building. Weathered beech tables and chairs were arranged sporadically and adorned with flickering storm lanterns. Nicole’s eyes were drawn to an imposing tree standing watchfully in the centre. Hauntingly beautiful, leafless branches twisted their way hopelessly towards the night sky. It was long dead and appeared to be locked in a perpetual state of winter. Rusted chains were eating into a silvery trunk that had grown to accommodate their presence, and fairy lights and Chinese lanterns illuminated the lifeless branches. It was a true centrepiece for such a bewitching venue, and Nicole was completely spellbound. Although the bar was busy, the atmosphere remained tranquil. The clientele were milling around, quietly socialising or sitting at the many candle lit tables—their conversations hushed. This was not a sight she was expecting to witness in the riotous town of Malia. Nicole recognised several faces as the staff from the various bars and clubs around the town. They were people that Anna had introduced her to over the weeks, and it dawned on Nicole that Zeus Xenias could be one of the exclusive worker bars she’d heard whispers about. She spotted Anna’s friend, Kelly from Oileus, in the corner talking to a couple of her colleagues. Fenny, the manager of the Black Rose Café was sitting at the bar chatting lightly with the barman. Nicole’s eyes were drawn to a table in the shadows. A group of men sat in the half-light with a particularly striking figure prevailing over them. Dressed in bike-leathers and a crisp white shirt, he was tall with swathes of long black hair reaching down as far as his waist. Anger and frustration shaped his features, which utterly captivated Nicole. At the table, three other men were listening intently to him, firmly rooted to their seats. His conversation halted abruptly as he shot a glance over to the girls. His eyes widened as he locked Nicole in his stare and her heartbeat faltered. He looked intently at her before his attention returned to the three men and he continued his discussion. Nicole began to breathe again. She tried so hard to look away but her gaze was automatically drawn back to him. Nicole noticed the fear on the other men’s faces; they seemed disturbed by the confrontation and she couldn’t help wondering—Mafioso? They moved over to the bar where Anna ordered some drinks whilst exchanging a few words with the barman. “Aiden, is Joel here?” There was urgency to her question and pain in her eyes. She shook her head but didn’t elaborate and Aiden didn’t push. “Joel’s not here but Marshall’s just over there.” Placing the drinks on the bar, he gestured towards the man Nicole had been staring at. Anna nodded. “Come on, Nicole,” she said, grabbing her by the hand. She led Nicole to an empty table where they sat quietly for a few moments. Reluctantly Nicole sipped her drink. The alcohol burned her throat. Bourbon wasn’t her usual choice but she knew she needed something strong and the heat of the alcohol began to numb her anxieties. Shifting in her seat, Nicole tried to compose herself. She glanced around at the other people in the bar. A few of them had noticed her and appeared as confused by her presence as she was. These people bore little resemblance to the sun-baked partygoers from the resort; many of them were pale in comparison—although they were all striking in a way she just couldn’t place. Nicole began to feel very conscious of the differences between them and herself, realising she was an unwelcome intruder within their discrete guild. With the low light inadvertently camouflaging her injuries, several people glanced over at Anna, gesturing to her with a nod or a smile. They remained completely oblivious to what their friend had been through that evening and Nicole hoped it would stay that way. Anna sipped her drink whilst continually watching the back of the bar. Watching for who or what? Nicole didn’t know but the pressure of the situation was becoming unbearable. As Anna spoke, the tall, dark-haired man advanced across the courtyard towards them. He moved quickly, his long hair billowing behind him with the momentum of his pace. Nicole couldn’t work out what it was about him that ripped through her, but she couldn’t take her eyes off him—and his remained firmly fixed on her. His frame was muscular and foreboding. There was nothing subtle about him. His expression was cast defensively as he continued to glare at her, and she completely froze as he approached. She assumed he saw her as a threat, a stranger who’d infiltrated his clandestine organisation. “Anna, you haven’t introduced us.” His deep voice was softer than Nicole had anticipated. His accent was beautiful, possibly local but Mediterranean at the very least. He spoke with a degree of urgency, preventing the intruder from leaving. “I was about to…” Anna was quick to answer. “This is Nicole. She came out here several weeks ago. She’s become a good friend.” She smiled in an obvious attempt to put Nicole at ease. The man’s eyes narrowed as he heeded the state of Anna. Reaching out, he brushed the wound on her face with the back of his hand. Without responding, Anna reached for Nicole’s hand—a small comfort in the presence of such an intimidating character. “This is Marshall.” Her eyes flickered up at him as she said his name. Moving into the seat beside Nicole, Marshall held his hand out. Nicole glanced nervously at Anna before reluctantly placing her hand within his, where it felt lost. Although his words remained firm, his expression softened and he laced his fingers with Nicole’s, causing her pulse to quicken. She studied him as he spoke; he was tall. His long, raven hair was swept neatly away from his pallid, olive features. His eyes were fiercely black and sunk deeply into the shadow of his brow; their darkness only seemed to accentuate the authority in his voice. Through her shock, she recognised his name as one of the lads Anna had been taking her to meet before their horrific ordeal. Jon obliged without question. Needing no further persuasion, Nicole stood up and let Jon lead her out of the bar. She didn’t speak or look back, and her pace quickened with each step until she was running. With her clearly confused chaperone a few steps behind, she hurried back towards the lights of Malia. Still reeling from the night’s events, nausea bubbled in her stomach, and she knew if she didn’t get home soon she’d either throw up or pass out. Consumed by guilt, Anna watched Nicole leave Xenias, looking utterly burnt-out. “Will you please come with me, Anna?” Marshall’s tone was stern. She nodded. Anna was used to keeping the company of vampires. She trusted them—they’d never given her a reason not to—until now. Not knowing what his reaction would be, Anna followed Marshall across the courtyard. She swallowed hard to try to relieve the ever-increasing dryness in her throat. As they headed over to Marshall’s table, a second vampire, Joel came over. His dark blond hair fell lazily around his shoulders, and he wore the long, leather military coat with steel buckles that Anna loved so much. He pulled her towards him, his firm hold instantly melting her fears away. Seconds later Joel’s brother, Joshua was by his side. From the sanctuary of Joel’s arms Anna glanced up at Joshua; his untamed looks were so familiar. Like most identical twins, these brothers were inseparable, but unlike most twins, they preferred their own metaphysical world to that of the mortals. They remained utterly silent, although they often glared at each other with an intense air of mischief. Anna often wondered what was going through their minds as they seemed to find it hard to keep a straight face most of the time. Katya, Xenias’ only female vampire, was already waiting by the table. A silvery gypsy skirt sat on her slender hips and combined with a white lace top—contrasted beautifully with her long, black hair. Solid silver bracelets were clasped tightly around both wrists and as usual, her feet were bare. With piercing blue eyes and lips painted in the richest of reds, her appearance never failed to intimidate. “Anna?” Katya’s eastern European accent was not as subtle as Marshall’s melodic tone. “What is this about you bringing a tourist here?” Her eyes narrowed as she awaited an explanation. Joel turned to Katya. As his expression hardened, a low, almost inaudible snarl, emanated from the back of his throat. He was very protective of Anna; they had a bond that neither Katya nor Marshall completely understood. Katya appeared unperturbed by Joel’s protective stance and knowing she had no fear of the twin’s impetuous temperament, Anna trembled. The shock of the situation was beginning to surface and an altercation with Katya wasn’t helping. Anna tightened her grasp on Joel before she could breathe her answer. “What? What did she witness?” Katya snapped, her eyes darting between Joel and Anna. “Something happened back in town; we’d been drinking and were heading down the road to ‘The Oasis’. Two men grabbed me, they pinned me up against a van, then pulled me into an alley. They had a knife.” Unconsciously, she brushed the angry wound gracing her cheek and winced. “I had no way to defend myself, I tried to get away—I tried so hard but there were two of them and they were hurting me, they were going to…” She tailed off, her eyes burning. She turned to Joel and relief came in the form of tears. Through misty eyes, she glanced at Katya. Like a buzzard circling her prey, the vampire waited for her to finish her explanation. Anna inhaled deeply, wiped her eyes and continued. “Joel came to me.” She glanced up into the concerned eyes of the enigmatic twin. “Where did you go?” she whispered, before emotion got the better of her. Rolling his eyes, Marshall turned his attention on Joel. “You killed them—in town—in front of that girl? I can’t believe you could be so reckless. How could you make such a huge mistake?” As Marshall spat his words at Joel, his balled fist struck the table causing a murmur from the workers at the bar. “Where are the bodies?” he asked. With a visible degree of self-control, Joel continued to glare at him. At that moment, his respect for Marshall clearly outweighed any other emotions he was feeling. Anna placed her hand on Joel’s shoulder and answered. Marshall stood up. “Joshua, I may need some assistance.” He scowled at the guilty pair and stormed off through the gates. Joshua stood up, and an eager grin spread across his face as he headed directly for his massive, black Honda Spirit parked out front. “Not now, Anna.” Marshall shook her off and mounted his VMAX. The engines roared to life and the two motorbikes disappeared into the night. “Let them go,” Katya called out. Joel grabbed Katya fiercely by the arm, a low growl emanating from within him. With his teeth bared, the growling grew increasingly deeper as his face met hers, but Katya’s expression remained resolute. Katya glanced at Joel, then back to Anna and sighed. “Actually I do understand…” Just for a moment, her temper seemed to ease and Anna wondered if there was more to this vampire than just hatred. “To be honest, I expect most women can. Leave Marshall to me, I can calm him down,” she stated before leaving Anna and Joel alone. Anna was surprised by Katya’s sudden change of manner and wondered what she meant. What hateful situations must she have encountered during her long existence to allow someone so naturally cold, to show such compassion? Anna had never been one to question the coven’s world, and up until now, had never really wanted to. It was clear Joel wasn’t letting her out of his grasp, but she didn’t mind—there was nowhere else on the planet she would rather have been than in his arms at that moment. Marshall may have held her respect but her heart belonged solely to Joel, the vampire—Anna’s vampire. As Joel gently wiped the blood and tears from Anna’s cheek, she wrapped her arms around him, buried her face in his long blond hair, and waited silently. It seemed like hours before the thunderous roar of motorbikes resounded around the courtyard, signalling Marshall and Joshua’s return. Moments later the two vampires entered through the gates. Sporting a look of satisfaction, Joshua headed directly to the bar while Marshall headed directly for Anna, his white shirt stained red and black. “Bring the girl back here early tomorrow night. I will discuss the situation with the others and decide what needs to be done. For now, Anna, go after her. I imagine she is in shock, so I need you to persuade her to keep quiet. Tomorrow,” he repeated before disappearing into the shadows. Anna stood up, and quietly left the bar. She tried hard to contain herself as she passed the other workers, avoiding all eye contact. They were, by now, realizing an indiscretion had been committed. It didn’t take long to catch up with Nicole. She was sitting on the pavement, in the predicted state of shock and exhaustion. Jon was helplessly hovering over her, looking just as useless as he must have felt. “I’ll take it from here,” Anna stated, crouching down beside her friend. “Cheers, Anna,” replied Jon, and left the two girls alone. The street was deserted and the sky was beginning to glow with the pinkish hue of morning. Major Point of View Change. I know it’s been a while since I posted, but I’ve been busy giving Véradó – The Workers a major overhaul. I am currently working on changing the third person point of view into first person. Slightly easier said than done, as this novel is not from just one characters perspective. I think it will have to be told from three characters pov’s as there doesn’t seem to be any other way around it, other than to leave it in the third person. My reason for attempting this drastic change is that it had been suggested that my characters were too distant from the story and to really get to know them would be to become them, so that’s what I’ve been attempting to do. As she spoke, the tall dark haired man advanced across the courtyard towards them. He moved quickly, his long dark hair billowed behind him with the momentum of his pace. He kept his eyes firmly fixed on this stranger who’d infiltrated his clandestine organisation. Nicole was unnerved by his staunch approach. His frame was muscular and foreboding, she felt threatened, there was nothing subtle about him. His expression was cast defensively as he continued to glare at this stranger. Nicole held her breath as he approached. “Anna… you haven’t introduced us.” His voice was deep but more gentle than Nicole had anticipated, his accent was beautiful; it sounded somewhat local, Mediterranean at the very least, and he spoke with urgency, so as not to give Nicole a chance to walk away. “I was about to…” Anna gestured towards her friend, “This is Nicole. She came out here several weeks ago and we’ve been spending a lot of time together.” His eyes narrowed as he heeded the state of Anna, he reached out and brushed the wound on her face with the back of his hand. “Who did this to you?” he seethed. Anna didn’t respond, she turned to Nicole, a weak smile clinging to her lips. She held Nicole’s hand in an attempt to comfort her in the presence of such an immensely intimidating character. “This is Marshall.” Her eyes flickered up towards him as she spoke his name. As Anna spoke, my eyes were drawn towards the tall dark haired man, as he began to advance across the courtyard towards us. He moved quickly, his long dark hair billowing behind him with the momentum of his pace. I can’t say what it was about him that ripped through me but I couldn’t take my eyes off him, and he kept his eyes firmly fixed on me. I guess he saw me as a threat, a stranger who’d infiltrated his clandestine organisation. His frame was muscular and foreboding, I can’t deny that felt threatened; there was nothing subtle about him. His expression was cast defensively as he continued to glare at me and I held my breath as he approached. “Anna… you haven’t introduced us.” His voice was deep but more gentle than I would have anticipated, his accent was beautiful; it sounded local, Mediterranean at the very least, and he spoke with urgency, so as not to give me a chance to walk away. “I was about to…” Anna gestured towards me, “This is my friend, Nicole. She came out here several weeks ago and we’ve been spending a lot of time together.” Anna smiled as she spoke, but I could tell it was purely for my benefit. The man’s eyes narrowed as he heeded the state of Anna, he reached out and brushed the wound on her face with the back of his hand. “Who did this to you?” he seethed. Anna didn’t respond, she turned to me; the weak smile clinging to her lips. She held my hand in an attempt to comfort me in the presence of such an immensely intimidating character. So, what have been your influences? 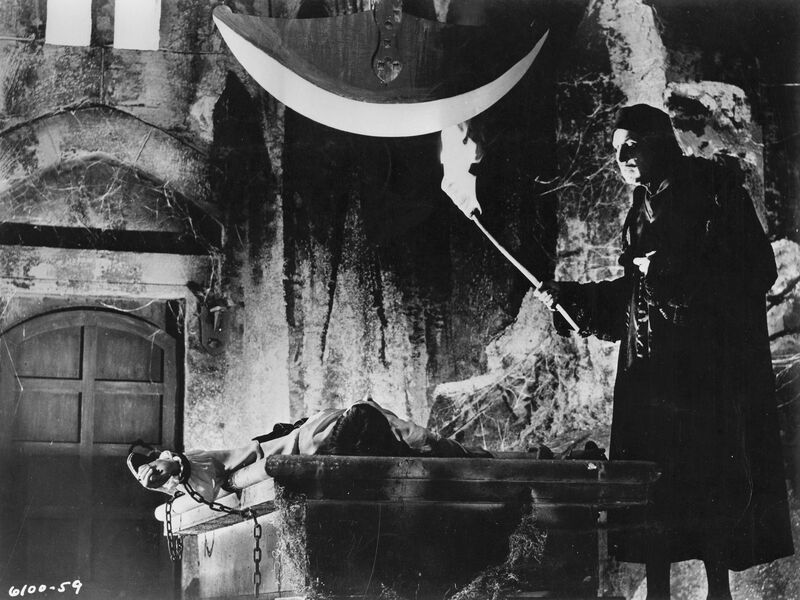 Having had the question put to me, ‘What books have influenced your writing?’ The answer that immediately sprang to mind was The Pit and the Pendulum by Edgar Allan Poe. Although this is only a short story I have always been completely seduced by his fear provoking descriptiveness. From the outset, how beautifully he conveys the feeling of being completely alone and helpless in the darkness. The reader is drawn into the feeling of claustrophobia and finds themself trying to breathe for him. Several times throughout the story he falls unconscious only to awaken in a different situation within his personal dungeon. We share in our narrators terror as he studies the indeterminably slow descent of the razor-sharp pendulum towards his tightly bound torso, gripping the reader as we join him in his horrific situation. To the horror of the pit – the pit of what? well I guess that is a question that only Poe would know the answer to. Hell perhaps or worse … if there can be any worse. I can only dream of being able to convey fear and emotion in the way Poe has in this story, but I will of course keep trying. As the motorbikes pulled up outside the huge oak gates, they simultaneously shut off their engines, shocking the dark dusty road into silence. Displayed above the gates, a large wooden sign with the words Zeus Xenia burnt into it welcomed the three men home. They dismounted their bikes and were greeted by a small group of people who’d gathered outside eagerly awaiting their return. Smeared with a mixture of blood and dirt, and with satisfaction ardently displayed on their faces they made their way inside. Their evening’s work was done. Once again order had been restored to the chaotic town they’d adopted as their home, and for the moment their ongoing debt to the island had been repaid. Now it was time for recompense. They thirsted, and these devoted disciples were keen to be the ones to sustain them. Once inside the ancient courtyard they continued up to the weathered oak bar. Strings of lights shimmered on the breeze and the air held the subtle fragrance of the ocean situated just meters away. The bartender glanced up as they took their places. He greeted them with a warm smile and poured their preferred bourbon into the glasses that awaited them. From the far side of the courtyard a woman approached them. A snug black dress caressed every inch of her body and complimented her elegant dark features. As she homed on her target her lips curved subtly into a smile. “Marshall, my darling … I missed you,” her undiluted Spanish accent chimed in his ears. She sided up to the vampire, her glossy chestnut hair scooped up into a sleek bun leaving her slender bronzed neck exposed and vulnerable. Marshall slid his hands down her arms and pulled her closely towards him, breathing in her warm aroma. It was not her fragrant perfume that enticed him but the scent of her blood that swept through his mind. Alessandro sought his bed that night with a fresh wave of nightmares sitting at the forefront of his mind. The inevitable fear was beginning to return, and with it an unwelcome heat rushed through his veins. He lay down and closed his eyes with visions of the deserted Bran Castle prevalent in his subconscious, he tried to keep his thoughts clear. His admiration for Katya was growing, he was beginning to understand why she behaved the way she did, why she was so detached and unobtainable. He lay there in the darkness, the sheer covering of the blind across the window threw up distorted shadows from the street below, shadows which if allowed would tell their own stories. Alessandro drifted into a light fractious sleep; the harsh dreams came rushing towards him. Like an apparition she walked towards him as he stood within the epic courtyard of a deserted stone castle at the mercy of the elements. Although his breath was visible in the bitter cold darkness no such warmth emanated from Katya’s lips, no mist formed in front of her as an indication of her essential life-force. She was cloaked from head to foot in black velvet, the hood falling over her eyes leaving only the lower part of her face visible, her brilliant red lips remained parted revealing her gleaming white teeth and her skin glowed silvery in the half light. She gestured for him to follow her, and without any form of restraint he found himself shadowing her as she walked into the darkness and descended a spiral stone staircase. She glanced behind her and smiled when she saw Alessandro was still with her. The stairs seemed to go on forever, the darkness in no way disabling him on his near vertical decent. Finally they came to the lowermost level of the castle, the staircase bled into a dank narrow passageway flanked on both sides by high stone walls. The bizarre couple made their way slowly along the passageway passing the remains of several ancient oak doors swollen and rotting in their frames. Katya didn’t stop, she continued past them to a large hole in the wall. She stood just beyond the opening and turned to Alessandro. He stood and looked at her, fear emanating from his features, he knew what was in there. She smiled once again and silently gestured with an open hand towards the opening. “I can’t Katya, I’m sorry.” The words woke Alessandro pulling him violently out of his dream. He frantically reached for his bedside lamp and flicked it on. A hiss came from the other side of his bedroom as Katya shielded her eyes with her hands. She was standing by the window with the blind open where she had been gazing out across the atmospheric city of Athens.